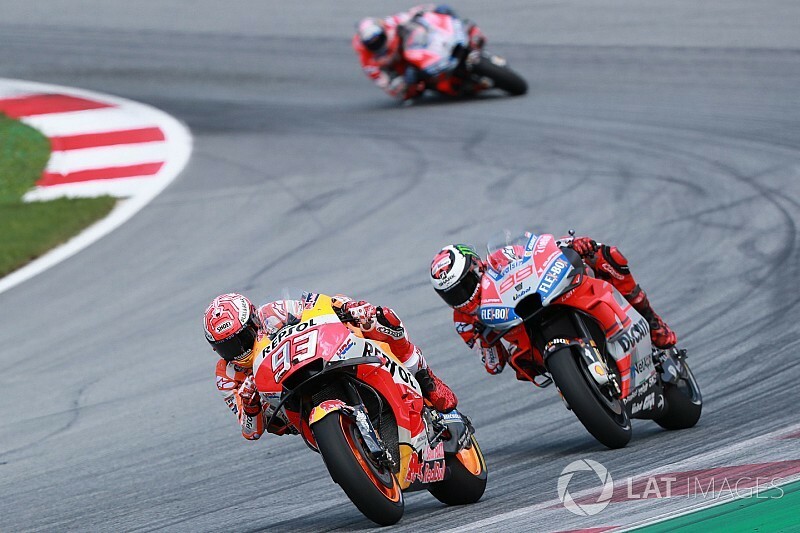 Starting from pole at the Red Bull Ring, Marquez was joined on the front row by the works GP18s of Andrea Dovizioso and Jorge Lorenzo – and the Honda rider and fought off early challenges from the pair with forceful moves on the first two laps of the race. He then tried to break away, establishing a lead of over a second by one point, only to be eventually caught by Lorenzo. Lorenzo beat Marquez to victory by 0.13s, while Dovizioso couldn’t stay with their battle and finished third. “Today I tried to change my strategy, tried to push in the beginning, because the goal was to try to arrive in the end [of the race] with only one Ducati – because a fight with Ducati is always difficult for us,” Marquez claimed. Marquez explained that successfully splitting off the Ducatis meant he would at worst lose five points compared to the race winner, as opposed to the nine he would give up if he was beaten by both Lorenzo and Dovizioso, as was the case at Brno. The Red Bull Ring result leaves Marquez 59 points ahead of his nearest rival, Yamaha’s Valentino Rossi, 71 points ahead of Lorenzo and 72 points ahead of Dovizioso. “For example in Brno I didn’t feel well, and then I just sat behind them [the Ducatis],” Marquez recalled. “Here I felt well and I was not conservative, because my plan was to have one Ducati in the end, and in case I lose points, I only lose five points. It’s not the same, losing five or nine. “So I was not conservative, I pushed with what I have, I had the hard rear, for that reason I chose, and the strategy was good. “It’s what I expected, I arrived [to the end] with one Ducati – the other one – because I expected Dovi instead of Jorge. 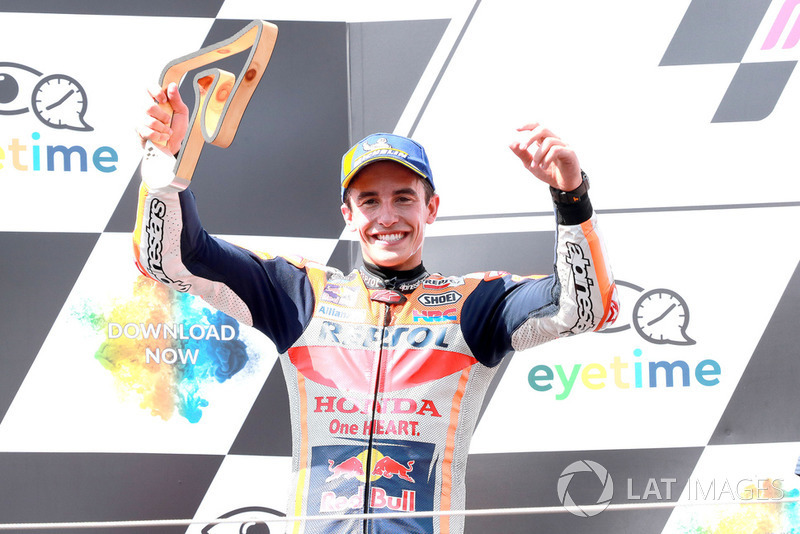 Marquez said he “nearly crashed” in his attempts to fight off Lorenzo on the final lap. He explained: “I said immediately ‘I need to try, because I am Marc and I need to try’, but every short straight he was able to overtake me, to be parallel, and it was really difficult to defend. “But even like this, I tried to lead the race in the last lap. I led on the main straight, he overtook me, then I tried in Turn 3, I lost the two tyres, I went in too fast and nearly crashed.